Unit B1 at Sunset Hale is our ground floor oceanfront unit on Sunset Beach. Unit B1 a 2-bedroom 2.5-bathroom ground floor oceanfront unit. Bedroom (1) in Unit B1 have (1) Queen size bed with their own private bathroom walk in shower and soaking tub, cable TV and ceiling fans. Bedroom (2) in Unit B1 have (1) Queen size bed and a Single over Full size Bunkbed with a private bathroom walk in shower and soaking tub, cable TV and ceiling fans. Unit B1 has a maximum occupancy of (5) guest. Renters must have Aloha Beach Rentals Hawaii issue our Rental Agreement Contract. for processing before we will approve excepting payment from our VRBO account. PAYMENTS: Payment for renting will be collected by VRBO/HomeAway.com using the Book it Now Option, when booking through Vrbo/HomeAway.com. Aloha Beach Rentals Hawaii collect all State and City and County taxes as required. Additional fees do apply such as Cleaning Fees, Damage Protection, Refundable Security Deposit. Our Credit Card processing fees is shown as (Administration fee) in the VRBO detail for the cost of the rental. ALOHA BEACH RENTALS HAWAII (ABR) reserves the right to collect all fees charged for Credit Card processing from Vrbo/ HomeAway.com when using a credit card for payment for this rental agreement term. Uncollected credit card fees will be deducted from the Security Deposit before it is returned. Vrbo /HomeAway.com Charges 5.12% on all International credit cards processing. Credit Card fees are set by Vrbo/ HomeAway.com, we will do our best to update this information if fees change. 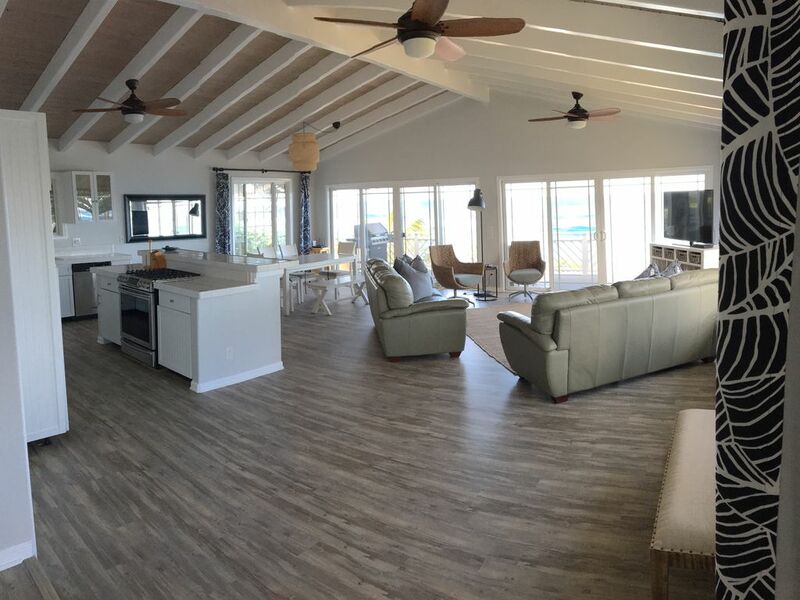 ALOPHA BEACH RENTALS HAWAII, is a locally owned and operated, or office is located on Oahu North Shore, so you are only a phone call away if during you stay you need any special attention or additional information about the north shore while staying with us. ALOHA BEACH RENTALS HAWAII, offers 4 great vacation rentals in the Sunset Beach area of Oahu's North Shore! All 4 of our rental have separate listings on Vrbo/ HomeAway.com, See our listing numbers below for your review Mahalo! We do not offer bikes at our rentals. For bike rentals go to North Shore Surf Shop next to Foodland or their large surf shop store location in Haleiwa Town. Tell them Big Fred sent you and get great bike at a good rate. Breathtaking sunsets, amazing surf, beautiful beaches, and relaxation are some benefits of staying at our beachfront home. BEDROOM # 2 Unit B1/Bedroom (2) in Unit B1 have (1) Queen size bed and a Single over Full size Bunkbed with a private bathroom walk in shower and soaking tub, cable TV and ceiling fans. Great location literally on the beach. Close to groceries and the food trucks. Clean, modern and quiet house. Owner is a good and honest guy that’s easy to get ahold of. I advise you to save time and just book this house now. Thank you for you kind review . We at Aloha Beach Rentals Hawaii, goal is to make the vacation rental experience for each and every customer special. Our goal and Slogan is, Live like the locals . Sunset Hale Unit B1... Amazing! Sunset Hale has been our choice for a 6 nights stay on the north shore. Looking for a quite and ocean front accommodation we found exactly what we expected, maybe even more. Far enough from the main road we only had to enjoy the sound of the ocean and the wonderful view of Sunset Beach with its palms and surf breaks. The nice and comfortable bed rooms with private bathrooms, the kitchen, the living room with the wide doors on the ocean, the lanai and the beach with private access a few steps away... everything as showed in the description. And last but not least, Fred, the owner/manager, such a kind person, great in communication. We really had a great time on the north shore thanks to this choice. Our family of 5 (children ages 6, 10, and 11) stayed at Sunset Hale for 8 nights. What an amazing house!!! The house was very clean upon arrival. We had breakfast and coffee on the lanai watching the surfers every morning. We swam in the ocean every morning and at every sunset. The outdoor shower was great so we wouldn't track too much sand into the house. The kitchen was fully stocked with all kitchen utensils, which was important to us because we cooked a lot of meals at the house. The bathrooms were large and spacious with huge bathtubs. The beds were very comfortable and the extra fans in the bedrooms came in handy for a couple of hot nights. We were very thankful for the beach towels and washer and dryer. The side yard and small side streets were fun for the kids to explore. And the pool table!!! Instead of watching tv to relax when at the house, our family played pool and loved it! We loved the location, as it was close to Waimea Bay, Shark's Cove, good surfing spots for beginners (August), and of course Sunset beach, Bonzai Pipeline, etc. Any time we had questions about the house or things to do Fred got back to us right away and was very helpful. We will most definitely be staying at Sunset Hale on our next trip to the North Shore. Awesome stay in a great beach front home. We stayed for one week in unit B2. The house was very clean, well taken care of, and up to date. Very nice for our family of 5. We really enjoyed the overlook and were able to watch whales almost every day at sunset. Very nice area, quiet, and friendly. we hope to stay here on our next visit. Vielen Dank Fred, wir hatten einen wunderschönen Aufenthalt im Traum Haus am North Shore!! Sehr gepflegtes Haus mit direktem Zugang zum wunderschönen Strand! The new sport of STAND UP surfing has entered a new phase where larger, wider and a more stable surfboards are being enjoyed by all age groups. People are doing Stand up. In a standing position and paddling these boards with long paddles on calm days are finding it great fun and a full workout for all levels. For the most experienced stand ups - they're surfing them in waves. STAND UP has really opened up the ocean to a larger group people. Lessons and group paddling classes are now offered in the area nicknamed Sweppers. Aloha Beach Rentals Hawaii, will directly issue the customer a RENTAL AGREEMENT (RA) through the VRBO website CREDIT CARD FEES OF 3% to 5% WILL BE COLLECTED fees will be liste as (Administration Fee) it will be calculated bases on Vrbo,s total amount paid to Aloha Beach Rentals Hawaii at a rate of 3 to 5% 3% Domestic USA 5% International Aloha Beach Rentals Hawaii, rental agreement (RA) must be returned by the customer as part of the reservation process.The rental agreement will need to be returned signed and initial where it is highlighted and the guest information page filled out. Please return the (RA) to ALOHA BEACH RENTALS HAWAII to the email address given to you once you have posted payment on the VRBO website All terms and conditions for renting are outlined in our rental agreement SEE DETAILS IN RENTAL AGREEMENT(RA) ON CANCELLATIONS: SECTION 8 CANCELLATION Reservation Cancellation must be in writing and sent to Aloha Beach Rentals Hawaii 60 days before Confirmed Reservation date for a refund It is the Leese responsibility to maintain a direct email contact with Aloha Beach Rentals Hawaii. Any Reservation Cancellations after the 60day cancellation period, all funds paid to Aloha Beach Rentals are Non-Refundable. Aloha Beach Rentals Hawaii reserves the right to retain the Reservation Deposit of $500 for any cancellation of a confirmed reservation, before the 60-day cancellation period. The following fees are collected by Vrbo or HomeAway.com (Vrbo Service Fee, Damage protection Fee &Security deposits). Vrbo /HomeAway.com will hold and be responsible for returning the (Security Deposit). Aloha Beach Rentals Hawaii reserves the right to use the (Security Deposit) on hold with Vrbo for the first $250 for loss or damages to the rental. Any loss or Damage claim over $250 will be filed under the Damage Protection fee insurance policy Rates may change without notice from season to season. Please reply to the email given to you by VRBO for US.